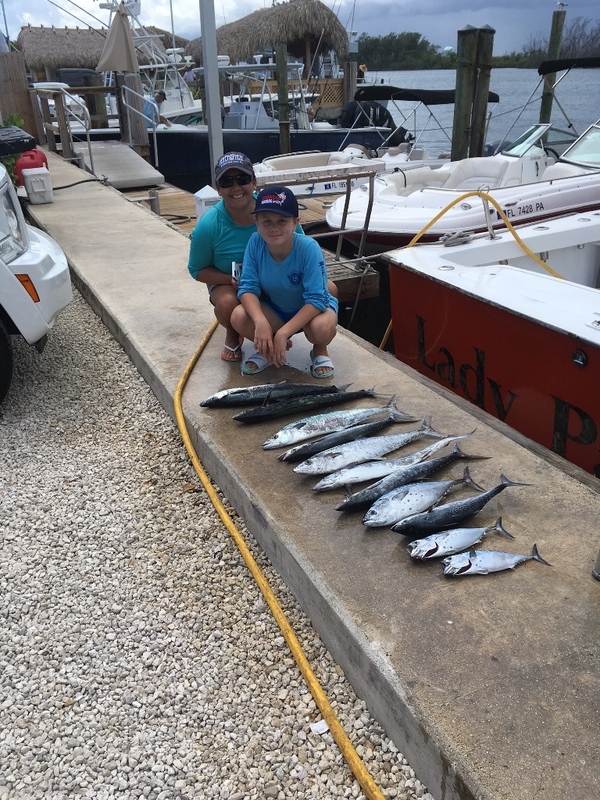 Fishing after Matthew has been great and it has been awhile since my last fishing report, we have been a little busy down here. With the threat of hurricane Matthew, we had much to do. Moving the boats, securing the marina and our homes in preparation for what was a very strong storm took precedent. Fort Lauderdale, Hollywood and Miami were spared the wrath of this storm. We were extremely lucky. Kingfish have been small but plentiful. Catching our limit has been easy trolling the reef area. A few Bonito mixed in and this is the time of year the Dolphin come in shallow to feed on the Ballyhoo. While most are caught in deeper water, it’s not unusual to see them in only 20’ of water just a few hundred yards from the beach chasing baits. Bait is another thing that has been prominent around. Flying Fish, Sardines, Mullet have all been on the move and this attracts fish. 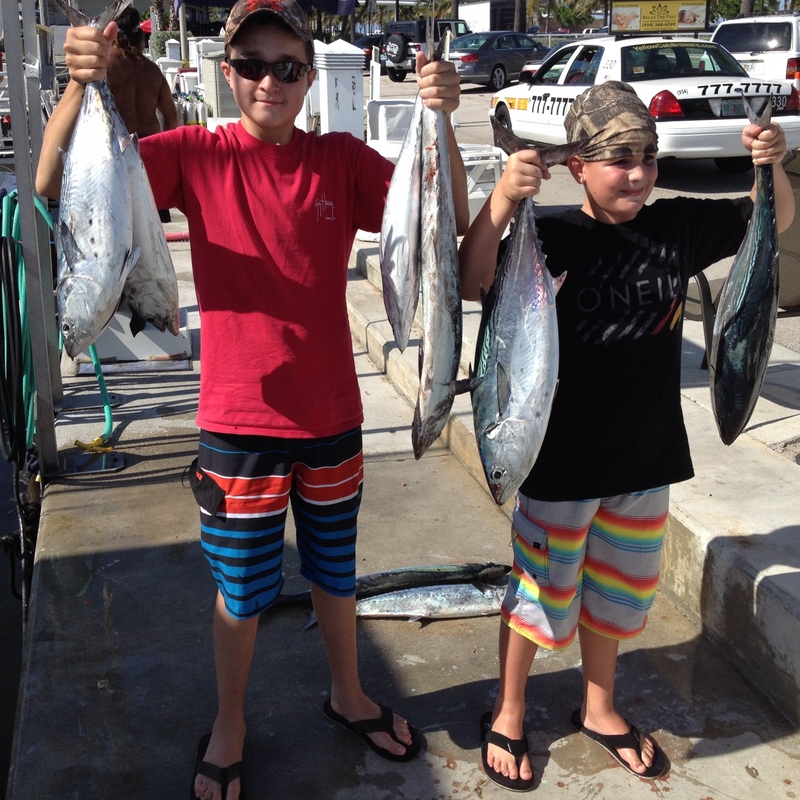 Skipjack Tuna is another fish usually caught further from shore but we got 6 the other day while fishing the reef. With all this bait around, things are changing as our weather finally cools. Sea temperatures are falling, somewhat drastic after the storm passed, and this gets fish on the move. Our area has always been like a highway for fish migrating, traversing the coast. We will be switching from trolling to live bait soon and are expecting great things. It is almost time for the Sailfish, one of our favorite sport fish, to arrive in numbers. Yes, fishing after Matthew has been very good and if you’re in the area? Take advantage of the bounty. I’ve included a couple of pictures including a rare one with me in it. I’m usually doing the taking. 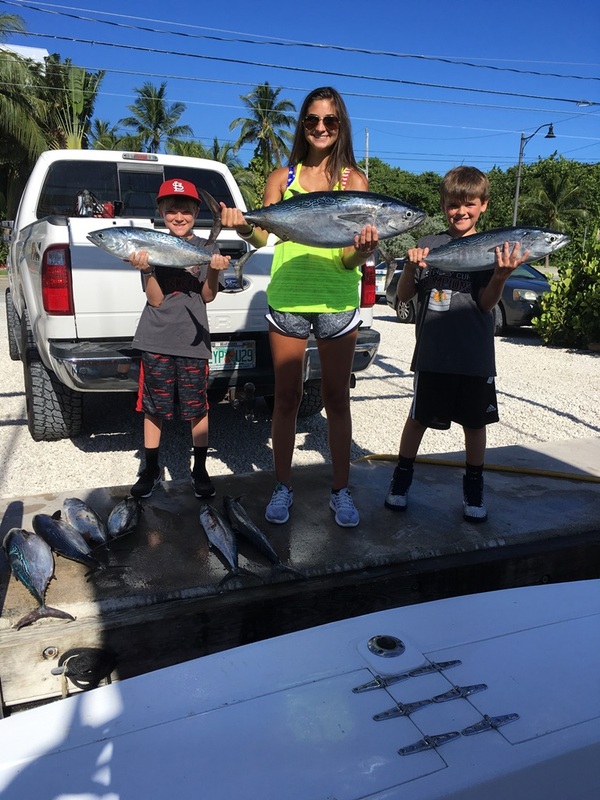 Our fishing this week in Fort Lauderdale was somewhat of a whirlwind of trips. This is our slow season, what with the kids back in school and few people traveling. We spend some of our time at the dock rather than fishing, sprucing up the boats for what will soon be a busier time. None the less, there still are a few people that want to be out there catching. 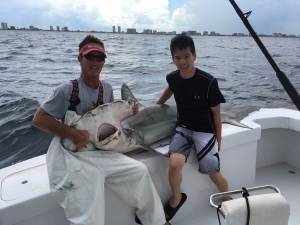 Fishing this week with us were 2 guests from China. ZhouTong and Xin were with us for 2 full days. Now I wasn’t aware of the rest or their trip until we met that first morning. They have a 15 day trip planned visiting 13 states. That alone was quite ambitious. 2 of those fishing days were with us and the plans for both trips were laid out before we even met. One day would be for fishing for Sailfish, other species allowed. The second day was to be spent bottom fishing, mostly Grouper. We had discussed all this in emails prior to the booking. I explained we might want to change things depending on conditions, swap days or whatever. None the less, the fishing this week was to involve these specific targets. Thank God they allowed other fish! Day 1 was planned by catching live bait, Ballyhoo, trolling in search of good water and then doing our best with Sails. It began horribly, the bait would not bite and the Bermuda Chubs were so thick, the Ballyhoo wouldn’t come close to the boat to be netted. A quick trip to the sea buoy for runners also proved to be a flop as they were not eating because of the strong current and their “mood”. A captains worst nightmare had begun and we weren’t 90 minutes into the first of 2 all day trips. 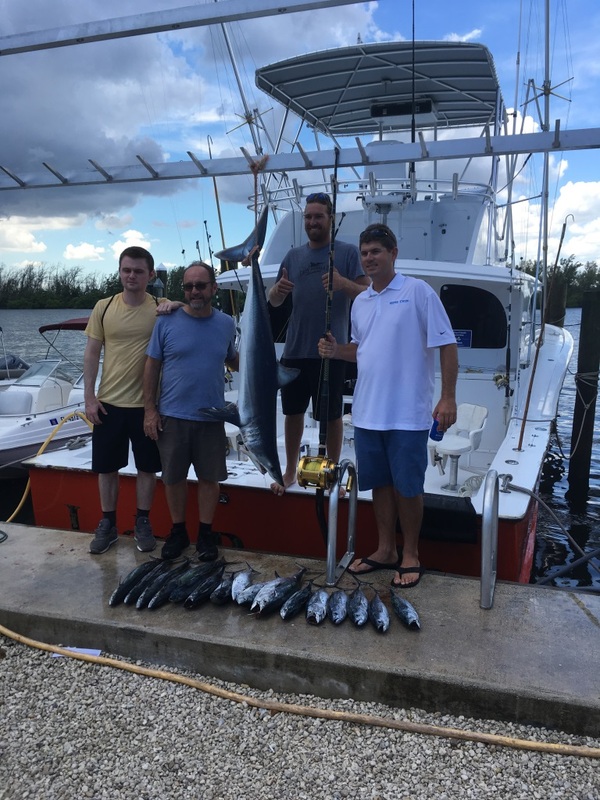 Trolling proved productive with Kingfish and Bonitos on the reef area and we finally managed to net a few Ballyhoo at another location as the boys slept. Their trip had included a 12 hour drive from Texas the day before with little sleep last night. A change of plans, some big baits out with a few “hoos” and we were fishing for something big! We hoped…And it didn’t take that long before a bite did come. It took about 30 minutes before we saw what we had hooked. 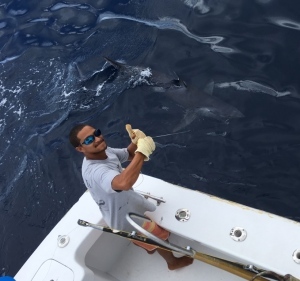 It jumping and clearing the water by some 6’ just 200’ away was our prize, a 7’ Mako Shark! Tong was in the chair and the fish was not done fighting just yet. Another 10 minutes or so and we had our fish beside the boat being quite good as Liam held the leader. 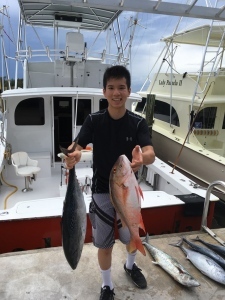 Actually, Liam was more excited about this fish than Tong or Xin, it was his first. They are spectacular animals with their bright blue color, pointed nose and rows of sharp teeth, an eating machine to say the least. This one was released and slowly swam away. A few hours left in day one and it was time for the Sailfish part of our trip. This did take some time as we slowly bumped our live baits around with the dredge out. Dredge fishing is one of my favorite ways to fish. The dredge, which looks like a school of bait does some of the attracting and today it brought us our first of 3 Sailfish. He was right there, behind the dredge, piled on one of the baits and we were on! We missed a second fish while fighting the first and had another shot after the release but missed him as well. For a day that started so poorly, we ended up well. That is all for fishing this week. Now are you ready to hear about sanding and painting? 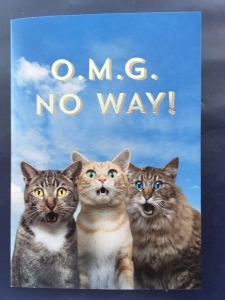 I didn’t think so… Thanks for listening. There are two times a year I look forward to and one of them is the Fort Lauderdale fall fishing. Our summer fishing pattern will be changing as the waters cool and all kinds of baitfish begin moving south. Trolling will remain the preferred choice for catching fish for another month or so before switching to live baits. 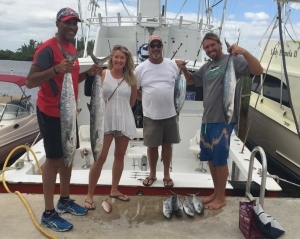 With the migration of bait come some changes in our Fort Lauderdale fall fishing catches. While the most obvious of baitfish, the Mullet migration which can be seen from the beach and in the canals, other types of baits are also making their way through our area. Bullet Bonitos, the smaller version of the “bomber Bonitos” we catch in the summer months, are everywhere right now. Sardines, Ballyhoo and Pilchards are also coming through in droves. 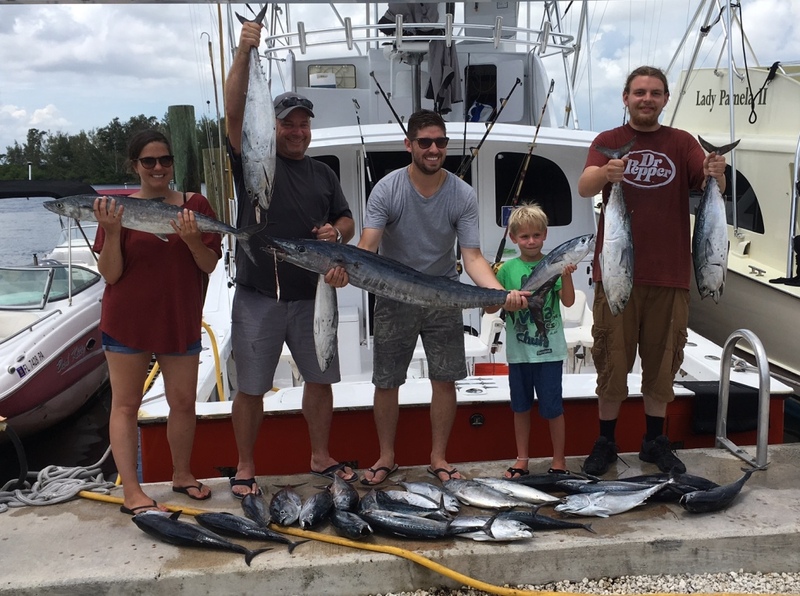 Wahoo, Sailfish and Dolphin are ALL making their way south, following this “feast” of migrating bait, and in many cases, in very close to shore. We have seen an increase in Kingfish on the reef, small groups of Dolphin chasing Ballyhoo and even Sailfish feeding freely on the surface. All this is happening this year a bit ahead of schedule. After the summer months of 90 degree heat, we look forward to some cooler temps and some bigger fish. Our weather has been outstanding with calm winds and seas and very little rain. Hope I don’t jinx it with that statement. LOL Conditions have been great for spotting fish feeding and bottom fishing. Most days even the current has been cooperating. These trends will continue into October as the sun falls further to the south and the waters cool. Some wind and waves will truly set things into motion. The Fort Lauderdale fall fishing has already begun. 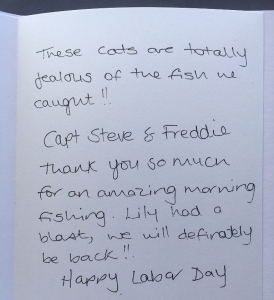 Each day could be that lucky day and the fish of a lifetime might be caught. BTW, Check out this short Video of the Porpoise we ran into today while fishing. There are days when we have to look around, searching for our first bite and that school of fish but the last few days, as soon as the baits go in the water, we have had bites almost immediately. Large schools of Bonito have been in our area and while these fish aren’t very good to eat, they provide plenty of action and fishing fun. Their real name is a Little Tunny and they are a false Tuna. Anything in the Tuna family will give you quite the struggle as they are fierce fighters. And by hooking one, the others in the school become excited and can hit every line you have out, as happened more than once today. When fish are biting like this, it is sometimes hard to catch anything but. We also were pleased when a 25 lbs. Wahoo joined us today. He kind of snuck in there on us among all the other fish. A nice Kingfish was also boated. Bonitos are a welcome sight on a shared fishing trip. First and foremost, it means everyone will catch a fish or two, maybe 3 or 4. LOL We ended up with 28 today. Even the young boy in the picture caught a few on his own. Also included in our catch were some small Barracuda that we released. If Bonitos aren’t very good to eat, why do we keep them? They are a valuable bait source for fishing here. By filleting and thinning the meat on the skin, we make strip baits that we use year round for trolling. We also use some of the smaller ones for whole baits for bigger fish. So if you are by yourself or maybe just 2 people, you might join us for a shared fishing trip. The fish are chewing, that’s for sure. 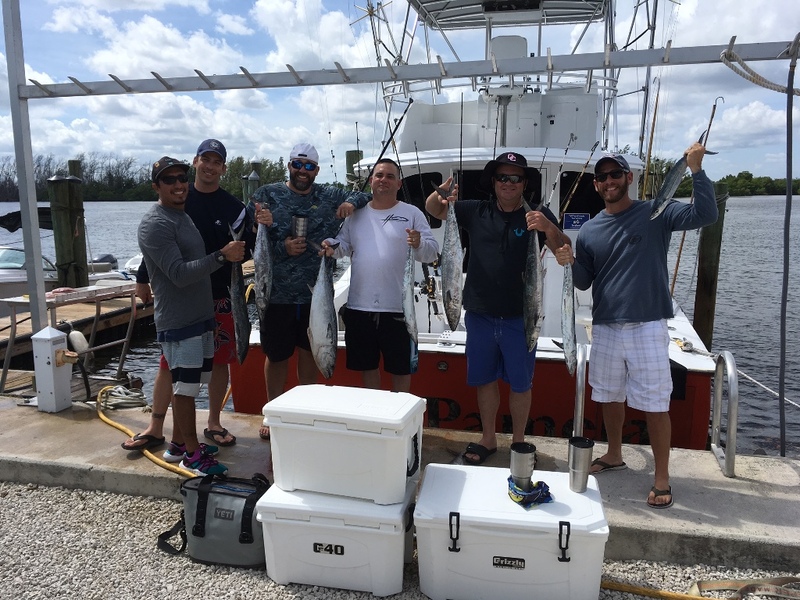 With Labor Day upon us and the threat of what became hurricane Hermine now gone, we can look forward to the September fishing forecast in Fort Lauderdale and Hollywood, Florida. September is a month of change as the waters here cool off shore and the migration of Mullet begin to move down our shores. The Mullet run is one of the most visible signs you will ever see. Easily seen from the beach, large schools of these bait fish can be found swimming south just off our shores. Ranging from the small finger mullet to full grown, they move slowly along the coast and through the canals. A look of “nervous” water above them and a dark shade from the school itself, they fill the inlets and waterways. Tarpon, Barracuda and other predators disturb the school and large splashes can be seen when they are being chased. While this is highly visible, other bait fish are also making their move south and this brings new food and migrating fish into our area. Mid to late September is when it begins and will run through most of October. Kingfish, Wahoo and Sailfish will be among the fish that will be enjoying the feast and we’ll be there to greet them. 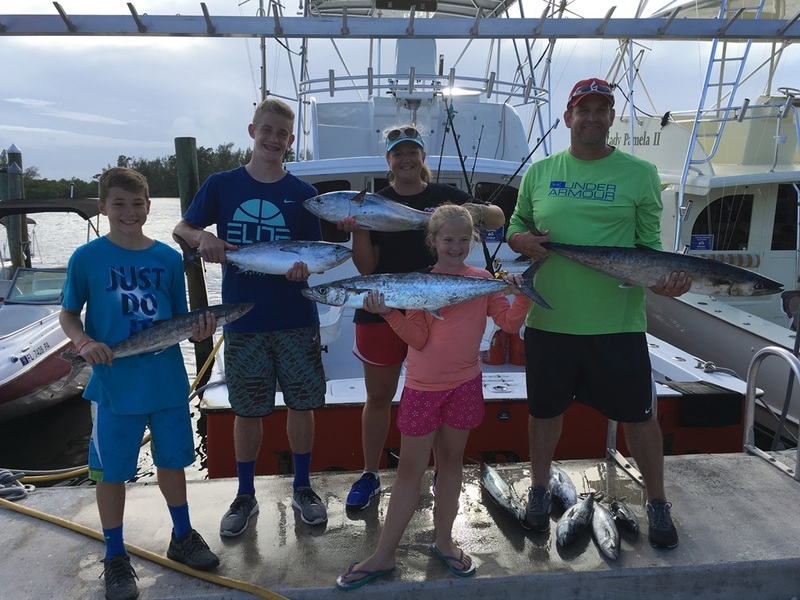 It’s been all smiles on the sport fishing boats with the Bonitos keeping us entertained. We’ve also been doing well with Small Vermillion Snapper on the bottom. They don’t get very big but when you can bring them up 2 and 3 at a time, it’s a tasty meal. There is always that chance of a Grouper or 2, Snowy’s have been biting in the deep waters. It is a lot of winding though, most are in 300-400’ of water! A couple of happy campers here holding some of their catch and that is ALWAYS our hope on each and every fishing trip. 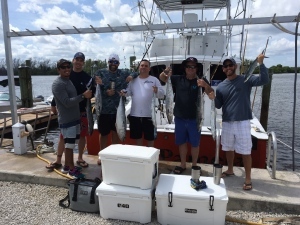 One of the great things about Fort Lauderdale fishing is the variety of fish that can be caught just a few miles from shore. 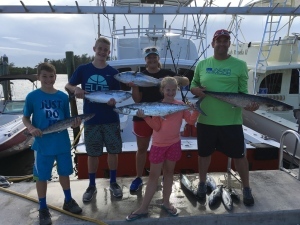 The fish can range from just a few inches, which serve some of our younger anglers well, to the large sharks and Swordfish and everything in between. While the Swords are usually caught further off the coast, I have seen and caught them in close to shore, there is no reason they can’t be there. Kingfish fishing is getting better with some nice sized Kings being found in deeper than usual waters. Normally in 80 to 150’, we’ve been catching 10-15 lbs. in 180 to 300’. Perhaps they are trying to escape the heat? Small Blackfin Tuna have also been caught in these depths. Today we had young Colin here on board, 11 I think. It had been his birthday and his aunt, Kalie, brought him fishing. 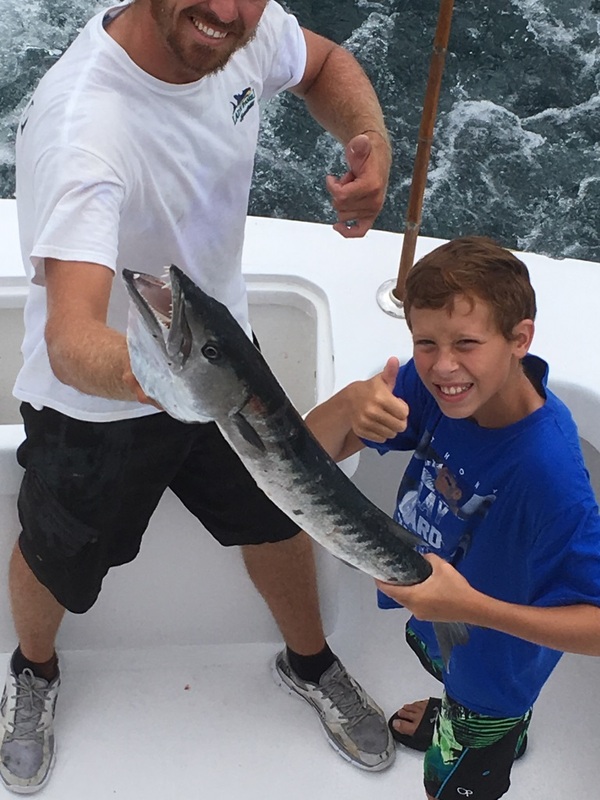 He was thrilled with the Barracuda and those teeth! Always an impressive catch, there have been lots of Barracudas around while trolling. Most have been small and somewhat of a nuisance as they destroy a rigged bait when they hit. As they get bigger, they often jump when hooked. It is always a thrill when a fish does that. 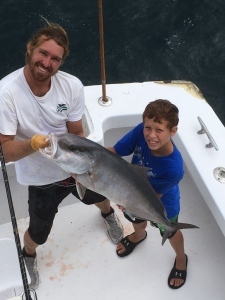 He also had the pleasure, maybe not the best word to describe his hard work, of catching large Amberjack. He is all smiles in the picture after but lots of grunting was heard as he handled one of the big reels and rods. Getting the kids out fishing before school starts has been popular as of late. 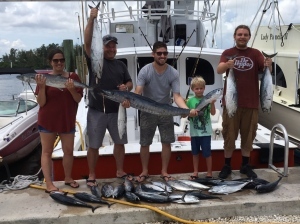 Fort Lauderdale family fishing has been booming! Whether it is a last vacation before going home or the locals here, kids seem to be on most our trips lately. Luckily for us, kids are easy to please and the action has been good. The reef area has been plentiful with Bonitos, a hard fighting fish not very good to eat but certainly fun to catch. Kingfish have also been adding to the filling of the box, as have Barracudas. Most of the Barracudas are small but still impressive with their almost canine looking teeth. The bigger ones make very impressive trophies. Out trip yesterday consisted of Alex, the dad, his son and daughter and their kids. 3 little guys with so much energy, ages 3 to 5. The morning seas had a slight chop to them so for this afternoon trip, we opted to catch some small fish for our small guys. A trip to an inside marker with some chum and bait rods did the trick and the boys caught 20 or so fish in a matter of 40 minutes. The seas had relaxed some and never affected the kids. We did some big game fishing, striking out in 2 spots with the “big ones” but caught a handful of nice sized snappers. None the less, it was great catching fish with these guys. My favorite angler of the group turned out to be mom. The great thing about women anglers is they listen. Being multi-taskers, they can also wind and listen to instructions without stopping, most men stop to hear, Just an observation on my part. Angie had so much fun winding in fish, she’d be laughing as she wound her fish in. We again struck out with something big but it didn’t matter. As you can see from the picture, they all had a great time. So whether you are from here or abroad, your Fort Lauderdale family fishing trip is waiting. But if you don’t hurry, you’ll have to wait for Christmas break. I’d like to introduce you to young Ryan shown standing here holding a couple of the fish he caught today. He was our solo guest on an full day fishing trip. His family became ill the night before and decided not to join him. I call him young because he is beginning his senior year in high school. When Ryan showed up at the dock with his backpack and light tackle spinning rod, I assumed there were more coming and they were just running late. At just 2 minutes before the bridge was to go up, he explained to me it was just him and we were off. It doesn’t matter on any of our trips how many people are there, we always fish as if there were 6 aboard and we sure weren’t going change that for Ryan. Our first stop was to catch some bait at the sea buoy and put that rod he brought to use. The baitfish weren’t biting well and it does take a little to get used to it but in the end we had plenty of bait for our trip and trolling to the north was our next plan. As our all-day fishing trip progressed, I found Ryan to be beyond his 17 years. He was extremely interested in what we did and how we did it. He spent most his time with Adam on deck and each bite brought a thrill as he reeled the fish in. At one point we had rods stacked up waiting for him to finish bringing in a fish so we could hand him another. And as the day went on, we changed our plan and decided to go for BIG! The trolling gear came in and the big rods and baits went out. As it can be in fishing, you have to wait for that bite. The way we fish for big fish can sometimes take a while, the scent of the bait being carried by the current. The fish pick up this scent and follow it to us and with luck, we connect. We’d been at it a while and the sky grew grey. Heavy clouds and wind were coming; a massive thunderstorm south of us was making things tough. That’s when the bite came and a big bite it was too. And this was when things got fun! One angler, one mate and one captain, three rods out, one with a fish and the other two in the way. Adam got Ryan set up and the rod strapped in and began clearing lines as Ryan began his battle. The threatening skies never got us wet and the winds reduced as Ryan worked the fish closer toward the boat. There’s always a little give and take, when the fish gives, you take and as much as you can. When the fish takes, you rest and let the straps hold the rod. You must always be ready to reel though; a fish can change directions in a micro-second. Finally, after 30 minutes or so, we could see color down deep and the fish kept inching closer. A large Hammerhead shark had eaten our bait and was growing tired, as was Ryan. He never complained, never faltered and his excitement was easily seen as he saw what he had landed. Pictures were taken and the measuring done for this trophy sized fish before it was released into the sea with the tag in place. These tags allow the Taxidermist to communicate with the anglers this fish’s location the next time it is caught, a very cool program. We headed home catching a few fish along the way and I have to say I very much enjoyed my full day fishing trip with young Ryan. I even found out what Pokemon go is. LOL He doesn’t play but explained it to me, usually my daughter’s job. Each time I take a family with kids, or maybe a birthday party for a kid, I know we’re going to have a good trip. The reason is kids don’t care what you catch or how big it is. They aren’t concerned with whether you can eat it or not. From the smallest Bonito and Blue Runner to micro Dolphin, they are excited each time the rod bends and the reel sings. The more, the merrier. Summertime is perfect for those family outings and parties. Close to shore all kinds of fish are in good numbers. Bonito, Kingfish, Barracuda (always a favorite), Wahoo and Tuna can all be found in close to shore right now. Trolling for these fish not only produces the most hits but also creates a breeze. With temperatures in the low 90’s almost every day, that breeze is welcome, believe me. And that is what is going on right now here in Fort Lauderdale just off the shore. Summertime is also a great time of year for an evening Swordfish Trip. Light winds and cooler temperatures at night make for comfortable settings as we head off shore 12 to 14 miles to the Swordfish grounds. There is always some fishing on the way out before setting our big lines and the chance at Dolphin, though Dolphin fishing hasn’t been great these last few days, widely scattered and on the small size, too small to keep at times. The 8 hour trip is a bit long for the kids unless they are really into fishing.